Branson Limousine is one of the most fascinating attractions in Branson which offers luxurious tour around the Ozarks. With this limousine tour, you’ll be treated to a smooth ride around the area in one of a variety of cozy vehicles, including a gleaming white, super-stretch Lincoln Town Car limousine which is beautifully outfitted with plush black leather seating. This exquisite limousine features fiber opting lighting, a starlit ceiling, a DVD player with flat panel monitor, and a mini-bar. Offered for luxurious tours by Branson Limousine are Excursion limousine, Executive Suburban, and a standard size Lincoln Town Car. Enjoy the fun, have a few drinks, and leave the driving up to the tuxedoed chauffeur. The two-hour scenic tour with Branson Limousine allows you to see Branson, the Ozarks Mountains and other local scenic spots or opt for some extension like spending a day in Eureka Springs and enjoy a great time in the area up to 4 hours. Enjoy a whole day of seeing exciting attractions in Branson such as live entertainment shows, museums, parks and head into town later for dinner. A whole day tour with Branson Limousine can also be enjoyed with a visit to Crystal Bridges Museum of American Art in Bentonville, Arkansas up to 4 hours at the museum or a total of 8 hours with two hours drive time each way. Branson Limousine also offers “Wine and Shine Tour”, a fun way to enjoy a few hours with girlfriends for a romantic afternoon for the two of you. With this tour, you can sample superb wine at two local wineries, and you’ll discover why locals rave about the smooth qualities and superior flavors found in locally handcrafted rums, whiskeys, and moonshine from Copper Run Distillery. Special Wine & Shine Tours offer complimentary grapes, mixed nuts, cheese & crackers, and sparkling cider in a champagne bucket on ice. Branson Limousine also offers 3-hour Branson Area Wine Tour that will let you experience a beautiful wine tasting in the winery. This wine tour includes a visit to two popular wineries in Branson, the Mount Pleasant Winery and Stone Hill Winery and to wine markets. This wine tour gives you the chance to enjoy a 10% discount at select wineries. If you need limousine service to and from the airport, Branson Limousine can also take you to the airport or pick you up at any hotel and drop you off at the Springfield-Branson International Airport or to the Branson Airport. You’ll enjoy airport transfer as it is fast and economical way to get from the airport and back in comfort, style and free from stress. Branson Limousine provides airport service to and from Springfield/Branson National Airport and Branson Airport. 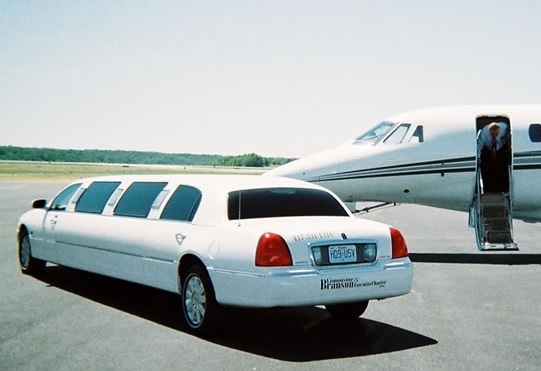 This airport service includes private non-smoking cars, baggage assistance, complimentary bottled water, flight monitoring, professional chauffeur with background check and drug alcohol tested. So, if you want to tour the Ozarks in a most luxurious way, choose Branson Limousine as they offer super-stretch Lincoln Town Car limousine driven by a tuxedoed chauffeur.